Alfonso Ortiz Solis Jr. 75, was welcomed into God’s loving arms on February 9, 2019. He was born to Alfonso and Rosalia Solis in Gregory TX on September 10, 1943. 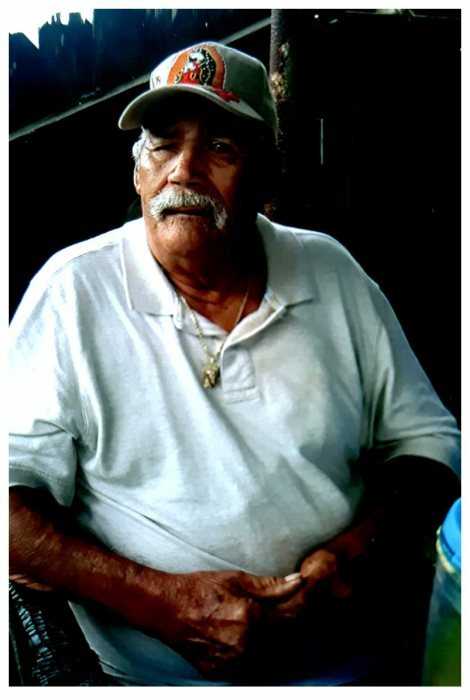 Alfonso was a loving father, grandfather, and great-grandfather. He is proceeded in death by his parents; wife Bella Solis, brothers; Joe Solis, Pedro Solis and Sisters; Lupe Lopez, Elida Cruz. Alfonso is survived by his son Alfonso (Elena) Solis, his daughters Imelda (Joe) Lopez, Alma (Araceli) Solis, Edna (Dena) Solis all from Gregory TX. His sisters Dora (Eppy) Hinojosa, Connie Moreno, and Rita Solis all of Gregory TX. Eight Grandchildren, 14 great-grandchildren and numerous nieces and nephews. The family would like to thank family and A-med for being there with us. Visitation will be from 1:00 PM – 8:00 PM with a Rosary at 7:00 PM on Tuesday February 12, 2019 at Limbaugh Funeral Home. Funeral Mass will be at 10:00 AM on February 13, 2019 at Immaculate Conception Catholic Church. Burial to follow to Gregory Cemetery.